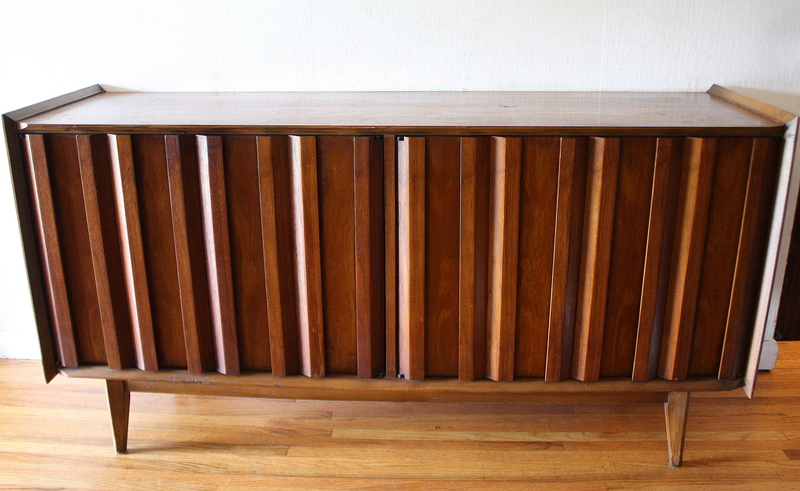 This is a mid century modern credenza with 2 rolling tambour doors, and tapered legs. The top has a great nothched angled design. Dimensions: 44.5″W x 20″D x 31″H. 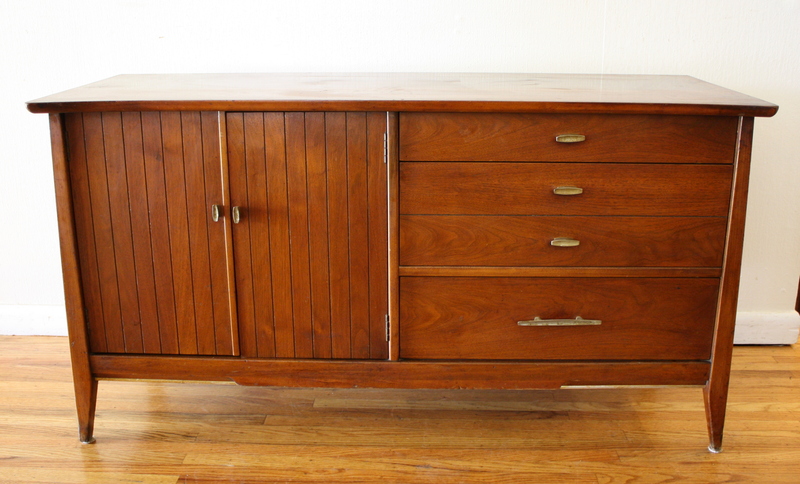 This is a mid century modern low dresser credenza by United. It has 9 dovetailed drawers with their signature sculpted drawer design, convex pulls, and tapered legs. Dimensions: 64″W x 19″D x 30.5″H. This is a mid century modern sliding door credenza in the style of John Van Koert. It has 2 sliding doors with parquet design and inside shelving unit, 4 dovetailed drawers with silver thumbprint pulls, and tapered metal tipped legs. Dimensions: 52″W x 18″D x 32″H. This is a mid century modern credenza 3 door cabinet. Perfect for storage or a media console, it has inside shelving in each compartment, brass knobs, and tapered legs: 70″W x 18″D x 32″H. These are 2 mid century modern low dresser credenzas. The first low dresser has 9 dovetailed drawers, with a sculpted handle design, and tapered legs. A sculpted middle door opens to reveal 3 smaller drawers: 64″W x 18″D x 30″H. 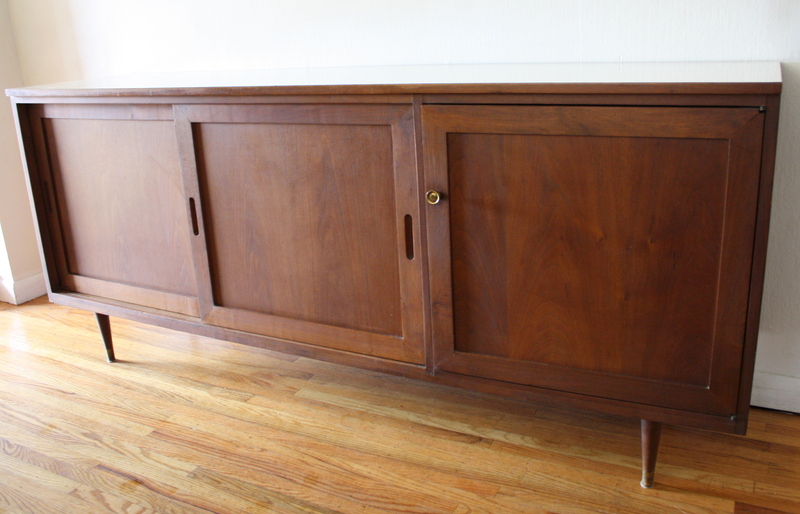 The second credenza has 9 dovetailed drawers with a streamlined drawer design, and tapered legs: 72″W x 18″D x 31″H. 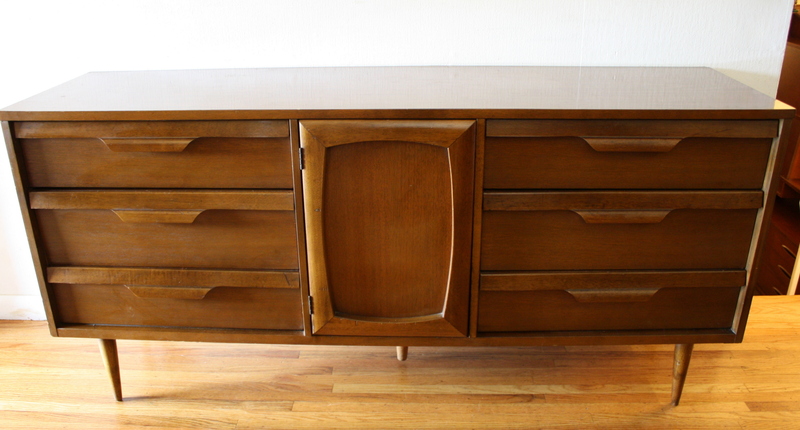 This is a mid century modern credenza media cabinet console. It has a mod white top, tapered legs, and 3 different compartments. The left and middle compartments have sliding doors and drawers. The right side compartment has a shelf and record slats that are removable. Dimensions: 71.5″W x 18″D x 31.5″H. These are 2 mid century modern credenza low dressers. Each credenza has 9 dovetailed drawers with a streamlined design. 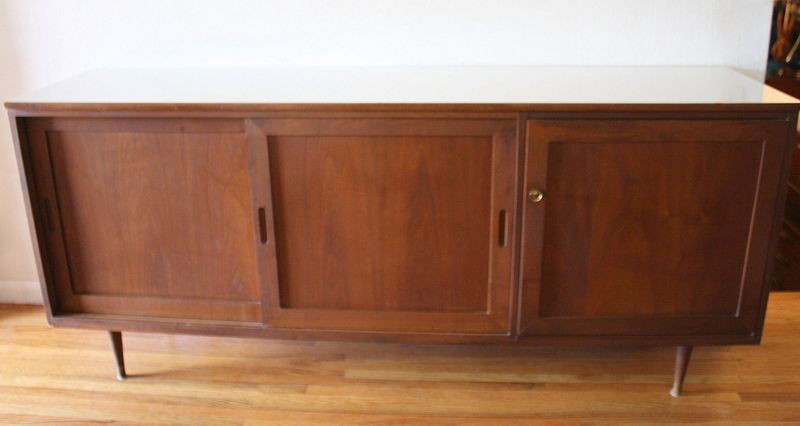 The first credenza is by Bassett: 59.5″W x 18″D x 30.5″H. Dimensions of second dresser: 60″W x 18″D x 30″H. 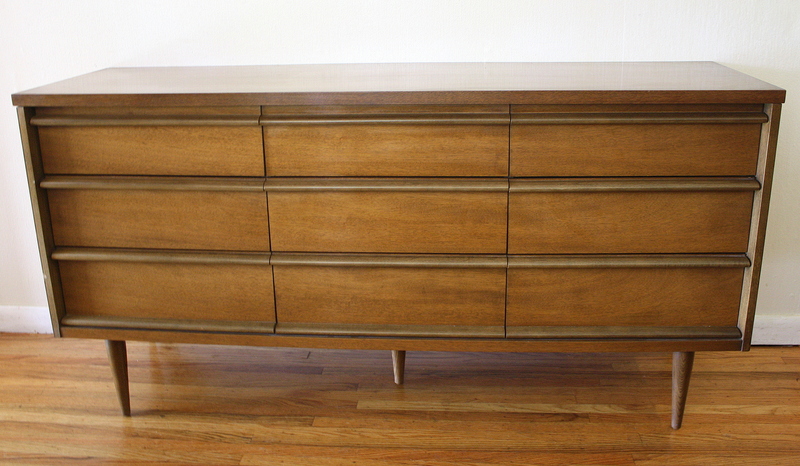 These are 3 different mid century modern credenza low dressers. The first is a Johnson Carper piece with concave drawers. It has 9 dovetailed drawers and tapered legs. Dimensions: 62″W x 18″D x 30″H. The second is a Bassett piece with brass drawer pulls and a side cabinet. It has 6 dovetailed drawers and tapered legs. Dimensions: 62″W x 18″D x 30″H. The third is a Lane piece with 6 streamlined drawers. Dimensions: 60″W x 18″D x 31″H. 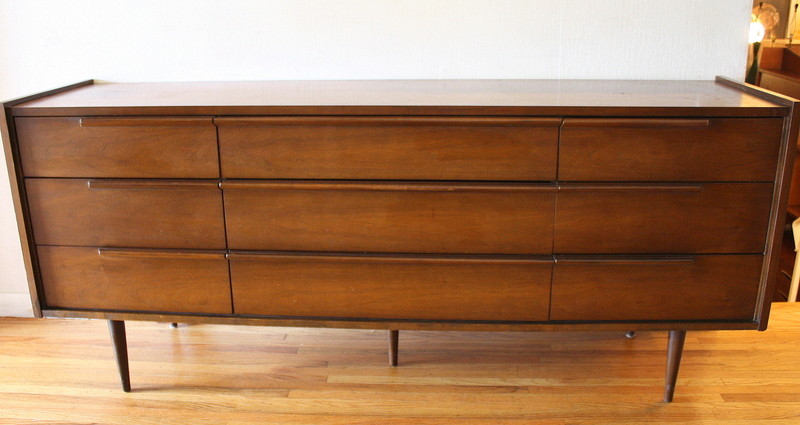 Here are some mid century modern credenza low dressers that we recently sold. We love the different styles, particularly the Johnson Carper piece with concave drawers.